London. 1998 (1999), Archigram Archives., Third Edition. (ISBN: 0-953511-90-1) Pictorial Wrappers, Oblong 12mo, 168pp, profusely illustrated in color and b&w. In a protective clear acetate dustwrapper. This is the compact and informative catalogue published in conjunction with a 1998 traveling retrospective of the work of the visionary London-based sixties Architectural theorists, Archigram. Edited by member Dennis Crompton, it contains contributions from associates Peter Cook, David Greene, and Michael Webb as well as Michael Sorkin, Barry Curtis and William Menking. A most presentable example showing some wear to the wrappers along with a dent through the upper foredge corner. It has been priced accordingly.. Good +. Tokyo. 1972 (1979)., A.D.A. Edita / Global Architecture., Later Printing. (ISBN: 4-87140-015-8) Pictorial Self-Wrappers, Folio, 48pp, profusely illustrated in color and b&w. Text in English and Japanese. This fifteenth installment in Global Architecture's (GA) series of monographs of the world's most significant examples of modern architecture is devoted exclusively to Frank Lloyd Wright's studios - Taliesin in Spring Green, Wisconsin, and the later Taliesin West in Paradise Valley, Arizona. It features a text by Masami Tanigawa, and as is typical with all of these GA titles, Yukio Futagawa's images are uncluttered and illuminating. A most presentable example of the 1979 printing showing a patch of adhesive ghosting and white-out tape at the upper foredge corner of the front free endpaper. It has been priced accordingly.. Very Good. Barcelona, SPAIN, El Croquis Editorial., 1992, First Edition. (ISBN: ISSN 0212-5683) Pictorial Self-Wrappers, Small Folio, 228pp, profusely illustrated in color and b&w. Text in English and Spanish. This fifty-fourth installment of the elegant Spanish quarterly journal "El Croquis" is a monograph devoted to the work of Spanish architect Juan Navarro Baldeweg conceived between 1982 and 1992. A pristine copy. PLEASE NOTE: Additional shipping costs are required for this item beyond our standard rates due to its weight - we will inform you of the applicable amount at time of purchase.. Fine. Barcelona, SPAIN, El Croquis Editorial., 1997, First Edition. (ISBN: ISSN 0212-5683) Pictorial Self-Wrappers, Small Folio, 192pp, profusely illustrated in color and b&w. Text in English and Spanish. This eighty-seventh installment of the elegant Spanish quarterly journal "El Croquis" is a monograph devoted to the work of English architect David Chipperfield that focuses on twenty-three projects conceived between 1991 and 1997. A most handsome copy of the softbound first edition from 1997. PLEASE NOTE: Additional shipping costs are required for this item beyond our standard rates due to its weight - we will inform you of the applicable amount at time of purchase.. Near Fine. New York & Minneapolis, MN, Rizzoli International Publications & The Walker Art Center., 1986, First Edition. (ISBN: 0-8478-0741-X) Cloth in Pictorial Dust Jacket, 4to, 216pp, profusely illustrated in color and b&w. Designed by Lorraine Ferguson. This is the nicely appointed catalogue published in conjunction with the Walker Art Museum's substantial 1986 survey exhibition of the work of internationally famed architect Frank Gehry. A bright, most handsome example of the first hardbound edition additionally bearing the BOLDLY SIGNED PRESENTATION "To Frank Pierson / F O Gehry" in black ink on the half title page. The late Mr. Pierson was a renowned Academy Award-winning screenwriter of "Dog Day Afternoon (along with the Academy-nominated "Cat Ballou" and "Cool Hand Luke"), director, and President of both the Writers Guild of America and the Academy of Motion Picture Arts and Sciences.. Fine/Fine. New York & Minneapolis, MN, Rizzoli International Publications & The Walker Art Center., 1986, First Edition. (ISBN: 0-8478-0741-X) Cloth in Pictorial Dust Jacket, 4to, 216pp, profusely illustrated in color and b&w. Designed by Lorraine Ferguson. This is the nicely appointed catalogue published in conjunction with the Walker Art Museum's substantial 1986 survey exhibition of the work of internationally famed architect Frank Gehry. A bright, most handsome example of the first hardbound edition additionally bearing the BOLDLY SIGNED PRESENTATION "For.. / F O Gehry" in black ink on the half title page.. Fine/Fine. Klagenfurt, GERMANY, Ritter Verlag., 1996, First Edition. (ISBN: 3-85415-202-7) Wrappers in Illustrated Jacket, 4to, 113pp, profusely illustrated in b&w and color. Text in English, Italian and German. 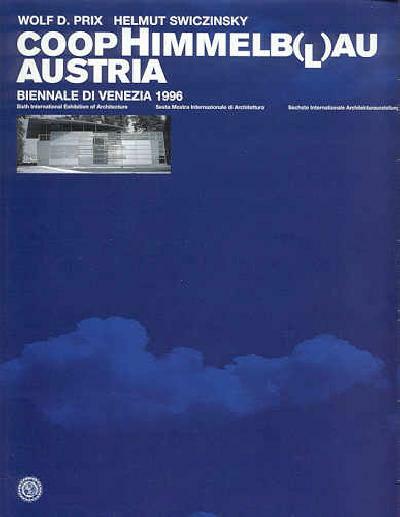 This is the catalogue published in conjunction with Coop Himmelblau's "From Cloud to Cloud" installation at the Austrian Pavilion of the 1996 Venice Biennale. Beautifully designed and printed, it reproduces many of the innovative architectural collaborative's trademark "automatic drawings". A brand new, most handsome example.. Fine/Fine. Tokyo. 1976 (1980)., A.D.A. Edita / Global Architecture., Later Printing. Pictorial Self-Wrappers, 4to, 184pp, profusely illustrated in color and b&w. Text in English and Japanese. 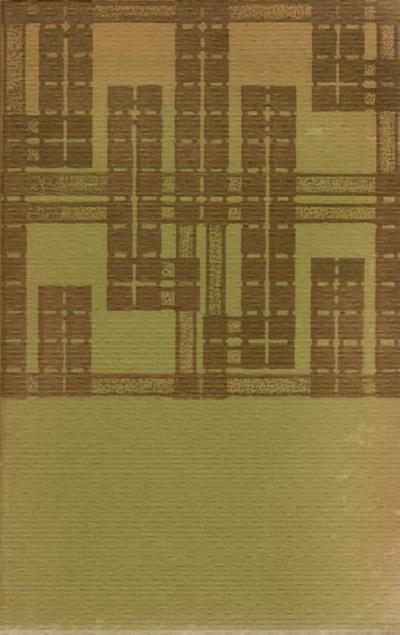 This is the second of two beautifully produced volumes in the Global Interior series detailing the interiors and furnishings of twenty-six completed projects by Frank Lloyd Wright. It was the first major photographic documentation of this aspect of architect and designer's work; and as is typical with GA books, Yukio Futagawa's images are uncluttered and illuminating. A most handsome example.. Fine. London, Phaidon Press Ltd., 1998, First Edition. (ISBN: 0-7148-3753-9) Boards in Dust Jacket, 4to, 160pp, profusely illustrated in color and b&w. With a chronology, exhibition history and bibliography. "This is the first full study of Pierre Koenig's career, providing an unparalleled insight into the evolution of Modernism on the West Coast. Koenig designed and built his first exposed steel house in 1950. In 1957 he was chosen to design Case Study Houses #21 and #22. These houses have become iconic, capturing the excitement and optimism of the period. This book includes new and vintage photographs together with the architect's original drawings". A brand new, pristine example of the 1998 hardbound first printing of this vital document devoted to the late Los Angeles architectural pioneer that is filled with vintage images by Julius Shulman and Marvin Rand additionally BOLDLY SIGNED AND DATED "Pierre Koenig 12-23-98" in the year of publication in black ink on the title page.. Fine/Fine. New York, Oxford University Press., 1978, First Edition. (ISBN: 0-19-520035-7) Debossed Cloth in Dust Jacket, 4to, 264pp, profusely illustrated in b&w and color. "Delirious New York" is renowned Dutch architect Rem Koolhaas' - of OMA (Office of Metropolitan Architecture) fame - highly influential manifesto regarding the modernist history of, and possibilities for the repurposing of Manhattan's urban planning and architecture. An internally bright, most handsome example of the uncommon 1978 first hardbound Oxford University Press edition showing some light wear, a few short closed tears, and a diagonal soft crease to the extremities of its Madelion Vriesendorp-illustrated dust jacket. It has been priced accordingly.. Near Fine/Very Good. Rotterdam, THE NETHERLANDS, NAI Publishers (Netherlands Architecture Institute)., 1997, First Edition. (ISBN: 90-5662-039-8) Loose Contents in a Box, Folio, np, profusely illustrated in color and b&w. Text in English. Published in conjunction with a 1997 exhibition at the Netherlands Architecture Institute, this is the innovatively designed box of printed elements related to the Boilerhouse extension of the Victoria & Albert Museum in London - a collaboration between noted architects Daniel Libeskind and Cecil Balmond (of Ove Arup and Partners Limited). It contains ten different project-related documents all housed in a beautifully printed heavy butcher paper over board clamshell box. A most handsome, complete example of this uncommon object in the publisher's printed obi, as issued. PLEASE NOTE: Additional shipping costs are required for this item beyond our standard rates due to its weight and value - we will inform you of the applicable amount at time of purchase.. Fine/No Jacket - As Issued. Beverly Hills, CA, Gagosian Gallery., 2005, First Edition. (ISBN: 1-932598-12-X) Printed Self-Wrappers, Square 4to, 36pp, 33 color illustrations. Designed by Massimo Vignelli. With an exhibition checklist. Published in conjunction with a 2005 gallery exhibition, this elegant catalogue is devoted exclusively to the modernist-inspired collages of legendary American architect Richard Meier. Typically created while traveling by air, and evoking Kurt Schwitters, Georges Braque, Mimmo Rotella, and the Russian Constructivists, these formally striking, intricately assembled artworks reveal yet another facet of Meier's mastery. A brand new, pristine example of this uncommon item additionally BOLDLY SIGNED "Richard Meier" in black ink on the title page.. Fine. Cambridge, MA, Harvard University Graduate School of Design., 1989, First Edition. (ISBN: 0-935617-12-4) Spiral Bound Stiff Wrappers, 4to, 72pp, profusely illustrated in b&w and color. Designed by Anita Meyer. Published in conjunction with a 1989 Harvard University Graduate School of Design exhibition, this is the elegantly produced spiral bound monograph devoted to Morphosis principal architect Thom Mayne's "Sixth Street House" project. A handsome example of this uncommon item additionally BOLDLY SIGNED "Thom Mayne" in black marker on the title page showing some light overall wear and soiling to the covers along with a bit of mild sunning along the spine. It has been priced accordingly.. Very Good./No Jacket - As Issued. London & Berlin, Academy Editions + Ernst & Sohn., 1993, First Edition. (ISBN: 1-85490-189-3) Cloth in Dust Jacket, 4to, 144pp, profusely illustrated in color and b&w. With a bibliography and award history. 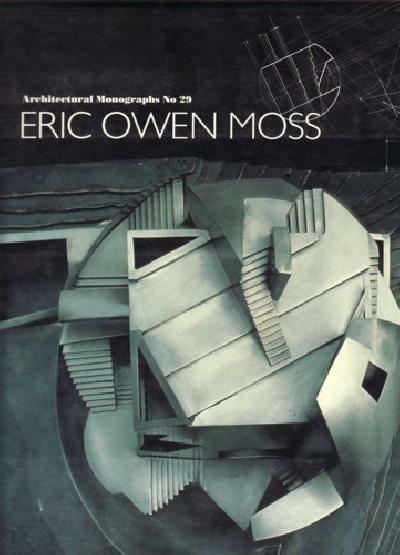 This is the first comprehensive monograph on the innovative work of Los Angeles-based architect Eric Owen Moss. It includes copious documentation for his many early Culver City commercial and mixed-use projects (including the "Thomas Ince Theater" and the 8522 National Boulevard complex), as well as residential and furniture designs. A most handsome example of the 2003 hardbound first edition. PLEASE NOTE: Additional shipping costs are required for this item beyond our standard rates due to its weight - we will inform you of the applicable amount at time of purchase.. Near Fine/Near Fine. NP (Los Angeles). ND., R.M. Schindler., Edition Not Stated. Printed Letterhead + Envelope, 4to, One 8 ½ x 11" sheet + one 4 x 9 ½" envelope printed offset recto only, no illustrations. This is a beautifully preserved matching set of a single piece of letterhead and envelope for use by R.M. Schindler's architectural firm located at 835 Kings Road - better known as "The Schindler-Chase Kings Road House". Each features an elegant variant modernist design printed in pale brown ink on off-white Weston Opaque Bond paper stock that incorporates the renowned Los Angeles-by-way-of-Vienna innovator's iconic hand-lettering and horizontal lines. A crisp, most handsome unused set of these two extraordinary ephemeral objects (estimated to date from the forties according to the Schindler scholar from whom we obtained these in 1990) showing just a bit of age-appropriate patination and handling. PLEASE NOTE: Additional shipping costs are required for this item beyond our standard rates due to its value - we will inform you of the applicable amount at time of purchase.. Fine. Keywords: Rudolf RM R.M. Schindler, Rudolph Michael Schindler, Architecture, Architectural Monograph, Ephemera and Announcements, Modernism, Modernist, International Style, Los Angeles, California Artists and Arts, - SCHINDLER, R.M. Santa Monica, CA, Arts + Architecture Press., 1978, First Edition. (ISBN: 0-931228-02-6) Pictorial Wrappers, Square 4to, 160pp, profusely illustrated in b&w. Designed by Joe Molloy. With a bibliography. In a protective clear acetate dustwrapper. Published in 1978 by the then newly-revived Arts + Architecture Press, "Vienna to Los Angeles: Two Journeys" is noted late California architectural historian Esther McCoy's detailed study of the confluence between R.M Schindler and Richard Neutra. It explores the great modernist architects' Viennese roots, and publishes for the first time scores of photographs, drawings, and typographically transcribed correspondence between Schindler and Neutra, as well as Schindler and the renowned Louis Sullivan. An internally handsome example of the paperbound first edition of this exceedingly uncommon item showing a bit of age-toning and sunning to the length of the spine along with some mild dampstaining at the heel. It has been priced accordingly.. Very Good - . Keywords: Rudolph R.M. Schindler, Richard Neutra, Louis Sullivan, Harwood Hamilton Harris, Esther McCoy, Los Angeles Architecture, California Artists and Arts, 0931228026 - SCHINDLER, R.M. Los Angeles & Cambridge, MA, Museum of Contemporary Art, Los Angeles & MIT Press., 1989, First MIT Press Paperback Edition. (ISBN: 0-914357-18-2) Pictorial Self-Wrappers, Oblong 4to, 256pp, profusely illustrated in duotone. Designed by Lorraine Wild. This is the elegant catalogue published in conjunction with the Museum of Contemporary Art Los Angeles' ambitious 1989 exhibition, "Blueprints for Modern Living". It contains essays by Reyner Banham, Dolores Hayden, Thomas Hine, Thomas S. Hines, Esther McCoy, Helen Searing, and Kevin Starr as well as entries by curator, Elizabeth A. T. Smith, and research assistant Amelia Jones on the thirty-six historic Case Study Houses commissioned by John Entenza and "Arts + Architecture" Magazine. It also includes documentation of six new projects sponsored by MoCA at the time of the show in the spirit of the CSH program. Each of the innovative houses designed between 1945 and 1966 is profiled in depth with drawings, blueprints, and photographs (many by Julius Shulman). The participating architects were Richard J. Neutra, Charles Eames, Eero Saarinen, Craig Ellwood, Pierre Koenig, Raphael Soriano, J.R. Davidson, Ralph Rapson, Whitney R. Smith, Sumner Spaulding and John Rex, Rodney A. Walker, Thornton Abell, Kemper Nomland and Kemper Nomland Jr., William Wilson Wurster and Theodore Bernardi, Buff, Straub and Hensman, Killingsworth, Brady and Smith, A. Quincy Jones and Frederick E. Emmons, and Don Knorr. The contemporary designs are by Adele Naude Santos, Craig Hodgetts and Ming Fung, Itsuko Hasegawa, Toyo Ito, Robert Mangurian, and Eric Owen Moss. A most handsome example of the 1989 first softbound edition of this important document showing just a bit of mild creasing to the rear cover.. Near Fine. Leningrad, RUSSIA, Leningradskogo ob-va arkhitektorov (Leningrad Society of Architects)., 1931, First Edition 1/5150. Printed Boards, 4to, 214pp, profusely illustrated in black and white. Text in Cyrillic Russian. In a protective clear acetate dustwrapper. The is the second of the three visually striking books written and illustrated by the pioneering Russian modernist architect Iakov Tchernikhov - better known in the west as Yakov Chernikov - published in Leningrad between 1927 and 1933. 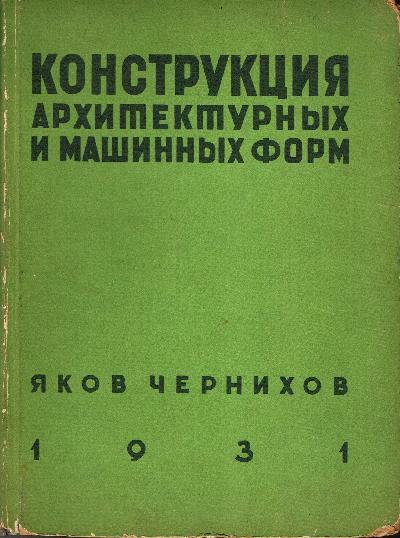 It features an introduction to Constructivism by Erikh Fedorovich Gollerbakh, two hundred and seventy-eight graphic text illustrations accompanied by forty full page plates by the author printed by letterpress. An internally bright and sound example of the 1931 first edition of this standout of Russian Revolutionary illustrated bookmaking (cited as entry 928 on page 227 in Margit Rowell and Deborah Wye's "The Russian Avante-Garde Book", entry 126 on page 40 in Jean-Louis Cohen, David Woodruff, and Ljiljana Grubisic's "Russian Modernism: The Collections of the Getty Research Institute for the Arts", and entry 72 on page 20 in Peter Hellyer's "A Catalogue of Russian Avante-Garde Books 1912-1934") showing typical notable wear, rubbing, and chipping to its brittle green decorative boards along the edges and spine. This seminal work was originally acquired from the library of the noted Russian-born, Southern California-based architect Samuel Reisbord, and bears his owner's signature in black ink on the front pastedown. It has been priced accordingly. PLEASE NOTE: Additional shipping costs are required for this item beyond our standard rates due to its weight and value - we will inform you of the applicable amount at time of purchase.. Good -/No Jacket - As Issued. London, Triangle Architectural Publishing., 1989, First English Language Edition. (ISBN: 1-871825-00-8) Pictorial Wrappers in Jacket, Small Square 4to, 208pp, profusely illustrated in b&w. With a biography, catalogue of projects, and bibliography. This is the 1989 English translation of noted architectural historian Bruno Zevi's detailed 1980 Italian monograph on the work of influential pre-war modernist architect Giuseppe Terragni. A brand new, most handsome example of this uncommon item.. Fine./Fine. 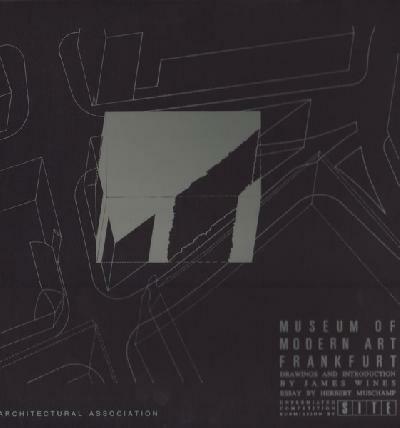 New York, The Museum of Modern Art., 1966, First Edition. (ISBN: LC 66-30001) Cloth in Printed Dust Jacket, 8vo, 224pp, profusely illustrated in color b&w. "Complexity and Contradiction in Architecture" is the 1966 treatise published as the first of "The Museum of Modern Art Papers on Architecture". Preceding "Learning from Las Vegas" by six years, it firmly solidified the then-forty year old Robert Venturi's place as one of the leading theoretical practitioners of the new wave of American architects. An exceptionally handsome example of the uncommon hardbound first edition bearing the BOLDLY SIGNED PRESENTATION "To Vaughan Cannon / from an admirer, / Bob Venturi / September 1968" in black ink on the front pastedown in a bright,white dust jacket showing a bit of brown spotting along the top edge of the textblock. The recipient, Vaughan Cannon Sr., was the longtime director of the Las Vegas office of the renowned Young Electric Sign Company - the firm responsible for designing and fabricating nearly all of the iconic neon hotel and casino signage from "Vegas Vic" to "Circus Circus" pictured in "Learining From Las Vegas".. Near Fine/Fine. London, Architectural Association., 1985, First Edition. (ISBN: 0-904503-62-3) Loose Plates in Decorative Box, Small Square Folio, 16pp + 18 sepia toned plates laid into the publisher's silkscreened portfolio, as issued. This is the seventh installment of the Architectural Association's coveted Folio Series - a handsome black decorative box that contains eighteen reproductions on heavy stock of James Wines' drawings for SITE as submitted to the design competition for The Museum of Modern Art in Frankfurt, subsequently exhibited in 1985 at the AA's London gallery. A handsome example of this elusive object whose box shows just a bit of light wear and handling along with a single short tear to the lip of the top inside edge. PLEASE NOTE: Additional shipping costs are required for this item beyond our standard rates due to its weight and value - we will inform you of the applicable amount at time of purchase.. Very Good/No Jacket - As Issued. Bern, SWITZERLAND & Vienna, AUSTRIA, Research Institute for Experimental Architecture & Springer Verlag., 2001, First Edition. (ISBN: 3-211-83643-8) Wrappers in Acetate Jacket, 8vo, 48pp, profusely illustrated in b&w. Designed by Lebbeus Woods and buro destruct. With a biography. The late, great Lebbeus Woods is best known for his visionary architectural renderings along with his contributions to the look of the films "Alien3" and "Twelve Monkeys", "Earthquake!" is the first in the RIEAeuropa Concepts series of monographs that present one new idea/concept per volume. It presents a summary of design research exploring the implications of earthquake for architecture and urban form in regions of seismic instability. The author believes that radically new design strategies are needed for these regions, and he presents his proposals in an extensive series of drawings and models for complex tectonic landscapes formed by unpredictable natural forces". A brand new, most handsome example of this uncommon item in the publisher's fragile printed acetate dust jacket.. As New./As New. Santa Barbara, CA, Art Galleries, University of California, Santa Barbara., 1971, First Edition. (ISBN: LC 73-634352) Illustrated Wrappers, 4to, 102pp, 98 b&w illustrations. Designed by David Gebhard. With a bibliography and selected list of buildings and projects. Issued in conjunction with a 1971 David Gebhard and Harriette Von Breton curated exhibition at the Art Galleries of the University of California, Santa Barbara, this elegant publication features reproductions of pioneering Los Angeles modernist architect Lloyd Wright's plans and drawings, vintage photographs, and a listing of completed works. A bright, most handsome example of the uncommon first edition - not to be confused with 1998 reprint.. Very Good -.